Resident Evil fans will no doubt be chomping at the bit to get their hands on the upcoming Resident Evil 2 remaster that’s being released by Capcom on January 25. The developers have taken the classic 1998 survival horror hit and completely updated the visuals for a 21st century audience. In addition, the popular character Ada Wong has received a new look. Videos and images from the new Resident Evil 2 remaster have already been circulating on the Internet, and it looks like Capcom is going to deliver with its claim of the game being “better than ever.” The original PlayStation game was highly praised for its graphics, story and atmosphere, and it has appeared on many lists of the best games ever made. However, it did receive some criticism for its gameplay and the use of tank controls. The remaster isn’t just the 1998 game dragged into 2019 with a slap of paint on it though. The problematic tank controls have been dispensed with and an over the shoulder third-person shooter perspective has been introduced (as was used in Resident Evil 4). A new camera system has also been implemented, removing the fixed camera operation used in the original game. It appears Ada Wong has also received a considerable update for the reimagined 2019 version. 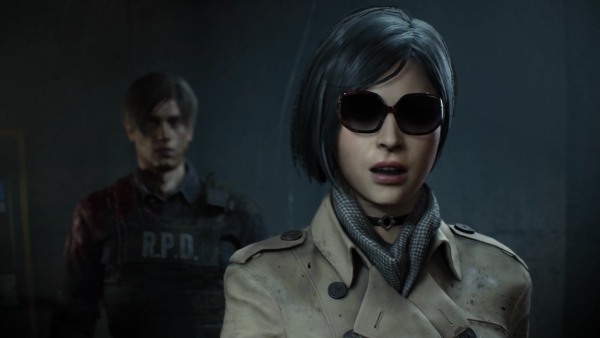 The famous red cocktail dress she wore in the 1998 game is temporarily replaced by a more serious look that incorporates sunglasses (perfect for shooting zombies at night), a scarf, and a detective-style trench coat. But as shown in official gameplay clips, that red dress, ideal for hiding zombie blood stains, soon makes a return to the action. In the story trailer for the remaster, Ada saves Leon S. Kennedy from becoming zombie dog food, which is an interesting switch from a cut scene from the 1998 version where Leon saves Ada from a nasty bite to the back of the head. Fans of the series can purchase Resident Evil 2 on January 25, and it will be available on the PlayStation 4, Xbox One, and PC. The original game sold nearly five million copies; and the 2019 remaster has already won the Best of Show title at the 2018 Game Critics Awards. You can compare the two versions of the game in the videos below (please be aware of mature content/horror/gore).